( November 8, 2014, Sydney, Sri Lanka Guardian) It appears that not only the country, but also the Left parties, particularly the LSSP and the CP led by you, are facing a crisis as a result. This is inevitable. However, the question is how you would come out of this crisis, uniting the parties that you lead, and addressing the issues at hand, not based on short term benefits for the party or for yourselves, but for the best interest of the country and the people. In short, I urge you not to support Mahinda Rajapaksa at the planned forthcoming presidential election for a Third Term. It would be a disaster for the country. I make this appeal as a long term supporter of both your parties, the LSSP and the CP, and this appeal is particularly addressed to Tissa Vitarana and DEW Gunasekera. Let me first recall our last personal meeting at the UPFA parliamentarians’ seminar that took place at Beruwala in July 2010 when the proposition of a Third Term or the 18th Amendment was first mooted. I participated as a resource person. Mohan Peiris also was there as a resource person and now I believe that a Third Term was his idea for the President. I recollect that you were both stunned at the development as you expressed at lunch we had together along with some others. Vasudeva Nanayakkara was quite open at the seminar opposing the proposition. That was also my turning point withdrawing my support to Mahinda, although not straightaway but eventually. In a way I regret that I was not in a position to join you to meet the President and express our dissatisfaction on the move when Tissa phoned me at home somewhere in August to go with you as a delegation. Perhaps I was also not clear, as we all were at that moment, or perhaps I didn’t want to compromise myself without clearly knowing what you would stand for. No one is infallible on these matters driven by various pressures and interests and only through experience and dialogue that a person or a party would be in a position to correct their positions eventually. I was extremely happy when I came to know that both the LSSP and the CP decided last year that their support for the 18th Amendment was a mistake. However, it appears that both of your parties now again have started to waver and backtrack on the matter. What prompted me to write this appeal is the crisis looming within your parties on the issue. The circulation of the ‘Aththa’ issue for this week is withdrawn by the CP. This is obviously a spillover effect of what happened at the LSSP Central Committee a week before. As I understand, a suddenly brought resolution to support Mahinda Rajapaksa for a Third Term was opposed by 13 members within the Central Committee. I understand DEW, you must have been displeased to see a critical article on Tissa in ‘Aththa’ in its feature pages. But the writer, Chameera Perera, is a LSSP Central Committee member. 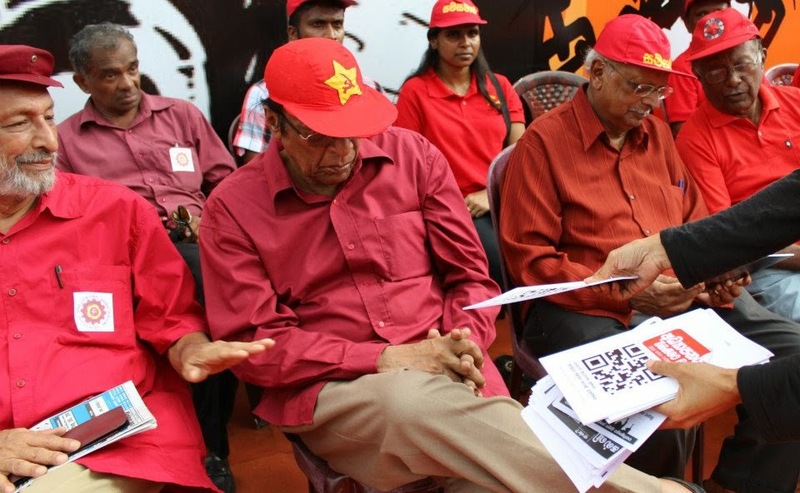 Although the article was critical of Tissa, it was based on the policies and principles of the LSSP, first and foremost to abolish the presidential system and uphold democracy. I have all my respects for the ‘Aththa’ Editor, (Dr.) Michael Fernando, who is an astute academic from Peradeniya. He has also given equal prominence for Tissa’s views on the same page. Freedom of expression is important for the country as well for the political parties. In your interview on 4 November Tissa, as reported in the same issue of ‘Aththa,’ you have stated that the LSSP decides its policies at its 5 year conventions and the last convention held four years back decided to ‘work continuously with the SLFP.’ However, as you had expressed to ‘The Island’ newspaper (23 November 2010) just after that last convention, you expressed the view that the “LSSP would consider issue by issue when extending its support to the ruling coalition.” I am directly quoting from Harischandra Gunaratna who reported that media interview. If that were the party position at the last convention, there is no binding agreement to support the government or the SLFP. Working with the SLFP has never been a dogma for the LSSP or the CP in its history. And on this particular issue of ‘family rule and attempted dictatorship,’ the SLFP itself is greatly divided and the position of Chandrika Kumaratunga and her supporters is entirely different. During the 1940s, the CP was cooperating with the Ceylon National Congress, the predecessor of the UNP. Both the LSSP and the CP were extremely critical of the SLFP policies particularly on the ‘Tamil national question’ well into the mid-1960s. After 1975, both parties had to leave or were expelled due to differences with the SLFP on both economic and political policies. The differences were milder compared to today. How does the LSSP or the CP could defend the rampant corruption or financial perversions in the name of development today? If not for corruption and financial banditry, the country could have achieved a double digit growth with equity, given the conducive conditions in the region and greater Asia. The Rajapaksas and their close associates are exploiting the economic growth for their personal ends and dictatorial rule. The predicament of the Tamils in the North and other minorities should be much concern for the LSSP and the CP as political parties of the oppressed and the marginalized. It is unfortunate that even within the debates on constitutional change or presidential elections these minority issues do not take a prominent place as they deserve. The SLFP today is not the SLFP of yesterday. It is within the grip of a family rule. Opposition to a Third Term is necessary to save the SLFP itself as a democratic party. There are many instances that you yourselves have admitted these tendencies. What required now is pure guts to make a final break and join the right thinking people in defeating the family rule. I understand that you and your parties have had useful dialogues with Ven. Maduluwawe Sobitha and his National Movement for Social Justice (NMSJ). I urge you to continue the dialogue and come to an understanding. The NMSJ is pivotal but only one movement in the opposition. Ven. Athuraliye Rathana and the JHU also have taken bold initiatives to oppose the dictatorial and family tendencies. Why are you lagging behind? This is a mind boggling question. Their argument is based on the fact that there is no hurry for a presidential election and the incumbent has two more years to go. In contrast, it is only the BBS that has vehemently come forward in defending the incumbent’s Third Term. It would be a historical tragedy, if the two main left parties – the LSSP and the CP - go along with the BBS on this matter. As you are also aware, the Bar Association of Sri Lanka (BASL) and former Chief Justice Sarath N. Silva have very clearly pointed out that even the 18th Amendment does not allow the incumbent to contest for a Third Term. It is to subvert this obstacle that the matter has now been referred to the de facto Chief Justice. He is the very person who was behind the Third Term proposition from the first instance, as you would recollect. He has not allowed the lawyers who oppose the move to submit their motions in the Supreme Court. What a justice? It is strange, but the Dictatorship has begun from Hultsdorf. Opposition to a Third Term for Mahinda Rajapaksa is not a personal matter. It is a principled one. It is linked to the abolition of the executive presidential system altogether. If we understand the gravity of the situation, a broader unity is necessary to stop the already fragile democracy turning into a full blooded dictatorship. On this matter, the lead story of the withheld ‘Aththa’ issue is quite instructive. It reads “A Different Horse from the UNP Instead of Ranil.” According to this news, the UNP leader Ranil Wickremasighe is now willing to propose a different candidate acceptable to all opposition parties and also on the platform of abolishing the executive presidential system. ‘Aththa’ is not any other’s newspaper DEW, it’s yours. This is not merely a news item but positive thinking. This opens up (although you two are far behind) immense opportunities to unite, put forward your own views, come to agreement with all others who would join for opposing a dictatorial Third Term. I hope and wish that you would reconsider your present stance in supporting Mahinda Rajapaksa.